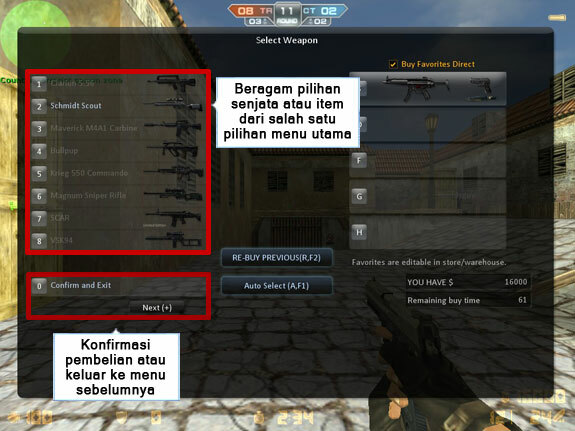 Purchasing weapons and equipment in the Original Mode is different from the Counter-Strike Online Mode. Right after you have entered the room and have chosen a character, then press the "B" button to access the purchase menu. From this menu you can see various types and choices of weapons, the amount of In-Game Money ($) you have and also the time limit left to make a purchase. If you feel like using a shortcut, you can enter your favorite weapon set. Pistol access various choices of Pistol type weapons. Shotgun access various choices of Shotgun type weapons. SMG access various choices of SMG type weapons (Sub Machine Gun). Rifle access various choices of Rifle type weapons (including Sniper Rifle). Machine Gun access a wide selection of Machine Gun types. Primary Weapon Ammo purchased additional ammunition for Primary Weapon. Secondary Weapon Ammo buy additional ammunition for Secondary Weapon. Equipment access a wide selection of items and additional equipment such as kevlar, hand grenade, smoke bomb, flash bag and so on. Knife access a wide selection of Melee types (melee weapons). Confirm and Exit exit the purchase menu. RE-BUY PREVIOUS (R, F2) Use the "R" or "F2" keys to buy the weapons used previously. Favorite Press one of the S, D, F, G or H keys to purchase a favorite weapon. These favorite armaments and equipment can be arranged further in Barrack . 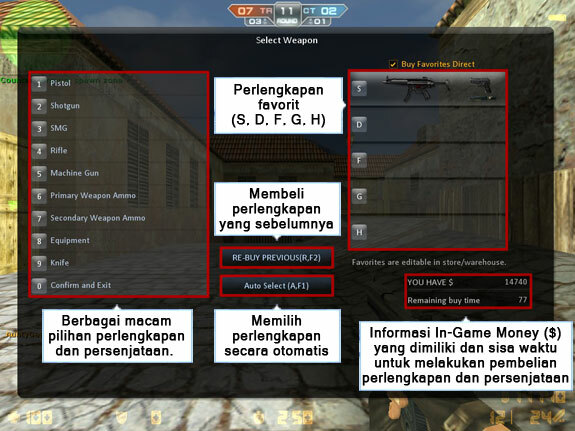 Each choice of weaponry available on the main purchase menu consists of several types and has been explained in the first part. There are several things that need to be known before making a purchase. The choice of items that are dark in color: indicates that the item cannot be purchased or not yet unlock so that players cannot make purchases on these items. In order to be able to buy these items you have to unlock first by buying items ( weapons or equipment ) at Item Shop. After that, the weapons and equipment that you have purchased will appear and can be purchased while in the purchase menu. After being sure of your choice, just press the button "0" or wait until the item purchase deadline ends. You will enter immediately and be ready to act with Counter-Terrorists and Terrorists.